If yesterday was a busy day looking at Venice apartments, today’s is even more so. At least the rain seems to be tapering off, although that blue sky has not yet appeared. We wake up still thinking about last night’s unique dining experience–at Gam Gam, Venice’s only kosher restaurant open to the public. 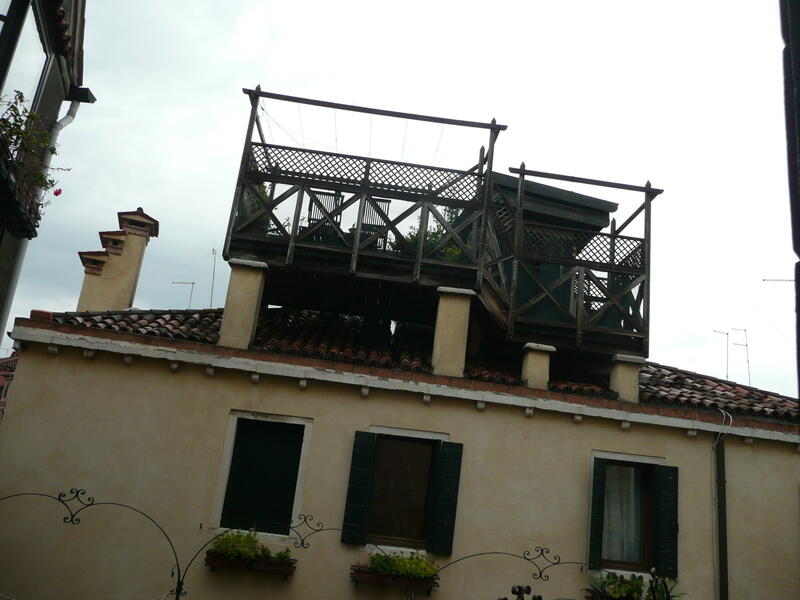 It’s located near the Ponte delle Guglie in Cannaregio, near the entrance to Venice’s Jewish Ghetto. To do a thorough visit to Venice, you have to consider the long and important history of the Jews here. Gam Gam has an elaborate menu, which includes both Italian and Israeli specialties. After a quick cappuccino, we are on our way again, seeking out the finest and most comfortable apartment accommodations in Venice. If you are looking for a place to stay in Venice, please contact us at Gira! and let us know how we can help. Keep in mind that many of the places we are writing about are available for a three day minimum, so you need not stay from Saturday to Saturday. 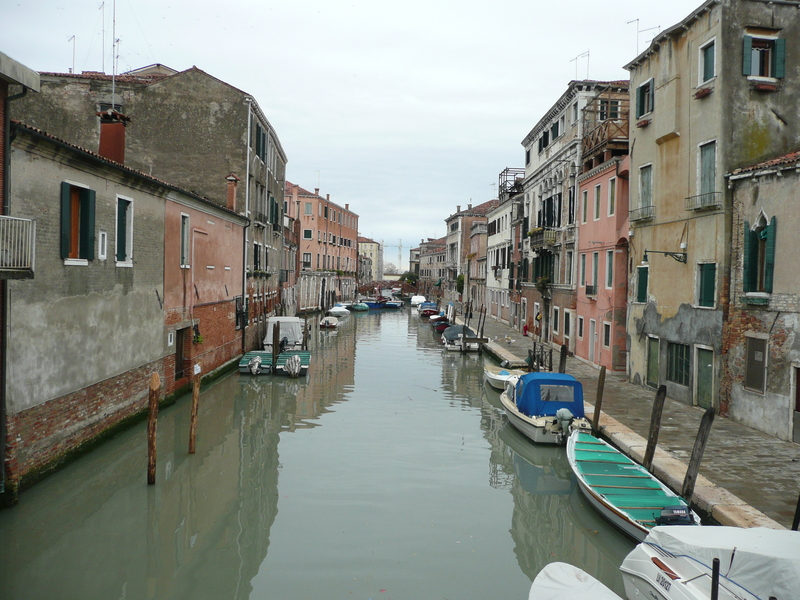 Today, we return to Cannaregio, but further into its characteristic neighborhoods. Here, instead of winding canals, there are straight and parallel canals that make for a nice neighborhood feeling, like adjacent city streets. The walkways that go along the canals are wide and friendly, which gives it the atmosphere of a quaint little town. This is a great area to stay if you want to unravel after a day of walking the narrow and winding streets that typify San Marco. Our first stop is at the apartment Altana, named for the type of ancient wooden terrace that projects out of the top floor roof. You see them in all parts of Venice. In order to have an altana, you must prove that there had been one there in the past. It’s not possible to create a new one. This is a five-star apartment, so it offers some nice amenities and lovely furnishings. Up a flight of steps and we are on the outdoor terrace itself. From here, it is possible to see snow-capped mountains in the distance and much of Venice. It’s a little too cool and too early in the day to enjoy a cocktail out here, but we keep it in mind for another time. Very close by is the apartment Silvana, a smartly furnished one-bedroom apartment. It has satellite TV and a dishwasher. Because it’s located on the ground level, it’s a convenient spot for a couple enjoying a visit to Venice. the special touches with the paint colors, doorknobs, fixtures and doorways. Ca’Lucia offers satellite TV and air conditioning, three bedrooms and three baths. The Guglie apartments are in a special historic setting where fabric was dyed for the Doge and members of the noble families. They offer an engaging contrast to the buildings around them, both inside and out. The owner has taken a distinctly modern approach to the design of the interiors and the accompanying furnishings. As we walk through the minimalist white hallways, we are delighted by the crisp and creative sofas, tables, beds and cabinets that have been chosen. I am sure that I am in a room of a gallery of modern art. There are seven air conditioned apartments here, arranged around a lush and colorful garden. It would be hard to beat Santa Sofia for both elegance and position. You enter the building through a white marble lobby area, which is adorned with marble columns, sculpture and a clever painting of Venice’s classic villas. Inside, it’s cozy and well appointed. Santa Sofia is a five star accommodation and earns it with a delightful outdoor terrace directly on the Grand Canal. Only a few blocks from Piazza San Marco is the apartment Spadaria. It’s on the second level, above a lively street with shops down below. The accommodation itself is on two levels, with a nice bedroom and bath up an unusual winding staircase. The first level has a modern kitchen and a comfortably furnished living and dining area. If you are interested in being close to the action, this is the place. From here, it’s time again for a quick afternoon coffee and we find a spot nearby. Refueled and on our way. Carampane is the final apartment visit we will do in Venice. It’s a practical ground-level accommodation in the Santa Croce district. It has an unusual layout, which employs two entrances. Outside there is a private equipped shady garden area amidst the lush trees and vines and grow around the building. One of the entrances to the apartment is by way of a classic courtyard known as corte del teatro. Exhausted from our labor of love, we say goodbye to our friends and look forward to a day of touring tomorrow to get to know Venice in a different way. And as far as we can tell, the weather will be much better! This entry was posted in 30 Days on the Road in Italy, Italy up close, Venice and the Veneto and tagged accommodations, apartment in venice, cannaregio, Italy, piazza san marco, villas. Bookmark the permalink.